Custom engrave metal coins and tokens with your design and copy, or choose from our 200+ stock designs. These metal coins and tokens are available in six different finishes: Anodized Aluminum, Antique Bronze, Antique Silver, Goldine, Nickel-Silver, and Natural Aluminum. Our minimum order is only 250 coins (1000 for aluminum). Volume Discounts are available. Delivery time is approximately four weeks (allow six weeks for Silver). 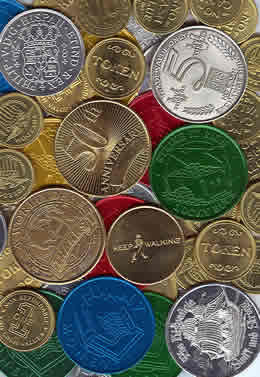 Metal Coins and Tokens are perfect as commemorative coins and awards, and can be used for bar drink tokens, Mardi Gras, parades, games, mailings, and giveaways. Metal Coins and Tokens are a great promotional tool for bars, lounges, and restaurants; clubs and organizations; conventions and fairs; grocery stores and shopping centers; insurance and real estate agencies; schools; auto dealers; hospitals; credit unions; retail stores, and banks. We have six finishes for you to choose from. Please click on the finish below for more information. For additional information on our Metal Coins, Tokens, Award Medals, or our many other gaming products please Contact Us at 1-800-233-0828. Feel free to browse our other Bar, Restaurant, Night Club, and Catering Supplies including Top Hat Ice Cube Buckets, Plastic Tokens and Wooden Nickels, and Light Up Ice Buckets and Serving Trays.